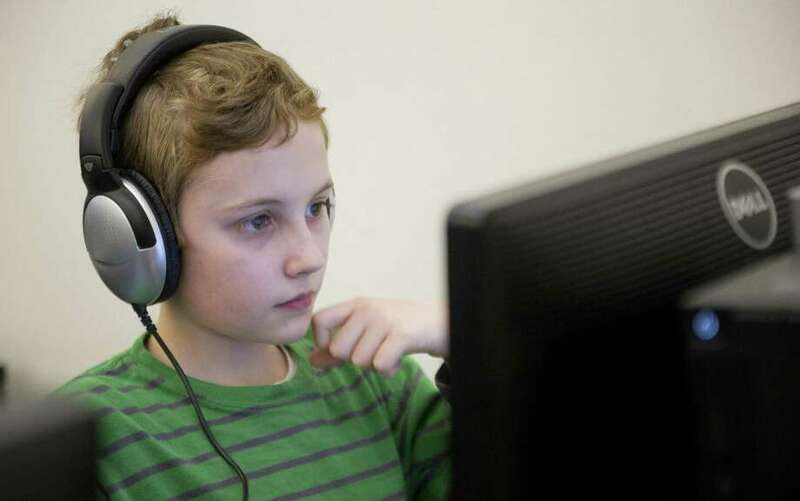 Hart Magnet School student Ryan Basile takes a practice SBAC test in 2015. Slightly more than half of the state’s public school students are at or above grade level in reading. The same cannot be said of math. Results of the state’s Smarter Balance assessment show that while 55.3 of third- through eighth-graders taking the test in the spring of 2018 met or exceeded the proficiency benchmark in language arts, in math only 46.7 percent of test takers hit the target. The state scores, released Thursday, mirror results on the 2017 National Assessment of Educational Progress (NAEP) released earlier this year, which showed Connecticut students continue to do better in reading than in math, where 40 percent or less scored at proficient levels. Still, state officials characterized the overall scores as promising. The percent of students statewide scoring in Level 3 or 4, which means they are considered at grade level or above. Ajit Gopalakrishnan chief of the state Department of Education’s performance office, said he would like everyone to be at 100 percent but was pleased to see some upticks, especially among what he characterized as the state’s more vulnerable student populations. Incremental improvement was seen across the state’s most needy districts in both subjects, as well as at Commissioners Network Schools, which receive extra state intervention. In both cases however, the percentage of students deemed as proficient remains far below the state average. State officials also said it was unclear if there was any narrowing of the achievement gap. The pass rate rose across the board in reading for black and Hispanic students, low income students, students with disabilities and English language learners. In math, the pass rate rose for all groups but Hispanic students. While 46.7 percent of all students met the math standard, 25.2 percent of Hispanic students did. Bridgeport, one of the state largest and neediest school districts, saw the percentage of students making the grade in language arts increase from 22.4 to 25.7 percent in 2018, while the percent proficient in math increased from 13.4 to 14.9. The percent of Bridgeport students passing the language arts tests in 2018 exceeded two local charter schools in language arts — Great Oaks (16.6 percent) and New Beginnings Family Academy (24.4 percent). Bridgeport School Superintendent Aresta Johnson said the gains were incremental but sustainable. “We plan to continue the growth that is currently underway,” she said, crediting literacy coaches — since cut from the district budget — with concentrating on grades 3 through 8, and a math initiative she said helped students make gains. Other local districts doing better in 2018 than in 2017 in both subjects included Ansonia, Derby, Easton, Fairfield, Oxford, Shelton, and Stratford. In Stratford, Schools Superintendent Janet Robinson said she was pleased with the continued upward trend. “Our approach has not been to teach to the test, but rather, we believe that by providing more rigorous curriculum with more student-centered instructional strategies, our student achievement will improve,” Robinson said. In Shelton, Assistant Superintendent Lorraine Rossner attributed that district’s 72.1 percent pass rate in reading and 63.2 percent pass rate in math to a concerted effort focused on curriculum and teaching strategies aimed at English language learners as well as a more intensive focus on math. “We believe we can continue to capitalize on our gains as long as we have funding available to support our programs aimed at student success,” Rossner said. In Derby, Schools Superintendent Matt Conway said that while continuing to find every way possible to identify and support students’ needs, it was encouraging to see increases in not only the percentage of students scoring a 3 or 4 — passing scores — but also in the number of students meeting their individual growth targets in reading and math. In the four years the state has given the new, more rigorous Smarter Balance test, the passing percentage has grown by only a few percentage points. The 55.3 percentage of students scoring at grade level in reading compares to 54.2 percent the year before, but is slightly lower than the 55.6 percent who reached proficient in 2016. In math, the 46.7 percent of students at or above grade level in 2018 is up from 45.6 percent in 2017. Grade level results show that while 53.8 percent of third-graders and 51.3 percent of fourth-graders crossed the proficiency mark in 2018 their scores were dragged down by fifth- through-eighth grade counterparts. Eighth grade brought up the rear with 42.6 percent deemed proficient. Gopalakrishnan called the standards reasonable for all students. “It is not that the target is too high,” he said. But it could be the wrong focus, he suggested. Results released Thursday include not just pass rates but compare students to themselves, showing, for instance, how much individual students grow from one grade to the next. The state measures that growth against how much it would take for them to reach 100 percent proficiency in five years. The farther behind a student is, the more they need to grow. On average, students statewide in 2018 reached 60 percent of their annual growth targets. The good thing, he added, is that by looking at growth, districts and schools get credit for any student growth not just students who cross a pass line. “That is where we need to see our energy,” Wentzell said. As for math, Wentzell said she assembled a Commissioner’s Council on Mathematics, which is still working on recommendations. One area being explored is the amount of time devoted to math instruction. Another group, convened last spring, brought large and small, rural and urban districts together who all had stronger growth than average growth, to share their secrets. The group included Danbury, Greenwich, New Haven, Shelton and Trumbull school officials. “We want to get out the word about what they’ve done,” Wentzell said, acknowledging that one promising practice — the use of math coaches to help quicken the pace of improvement — has fallen victim to budget cuts in districts like Bridgeport.